Design inspired by the famous M9 bayonet. Steel handle w/ textured grip. 8 1/4 in. overall opened, 3 1/2 in. blade, 4 3/4 in. closed. For the price this is a great knife, though the curve of the handle and the clip are slightly awkward till you adjust to it. The blade has a great edge and the serration tore through a piece of robe as well as saw. The ring on the back meant to emulate a mount for a bayonet is irritatingly in the way of the actuator there. I also had to pull the knife apart and oil it to get the smooth opening action I prefer. All in all I'm satisfied, but the ring on the back is frustrating and annoying. another great knife from true swords! quite the bargain at $8. good size, weight, and sharp blade. the only thing i don't like is the clip, which it seems i can remove. easy to open, perfect size, has many uses, defiantly a man knife. I received the knife maybe a little under a month ago. its amazing. 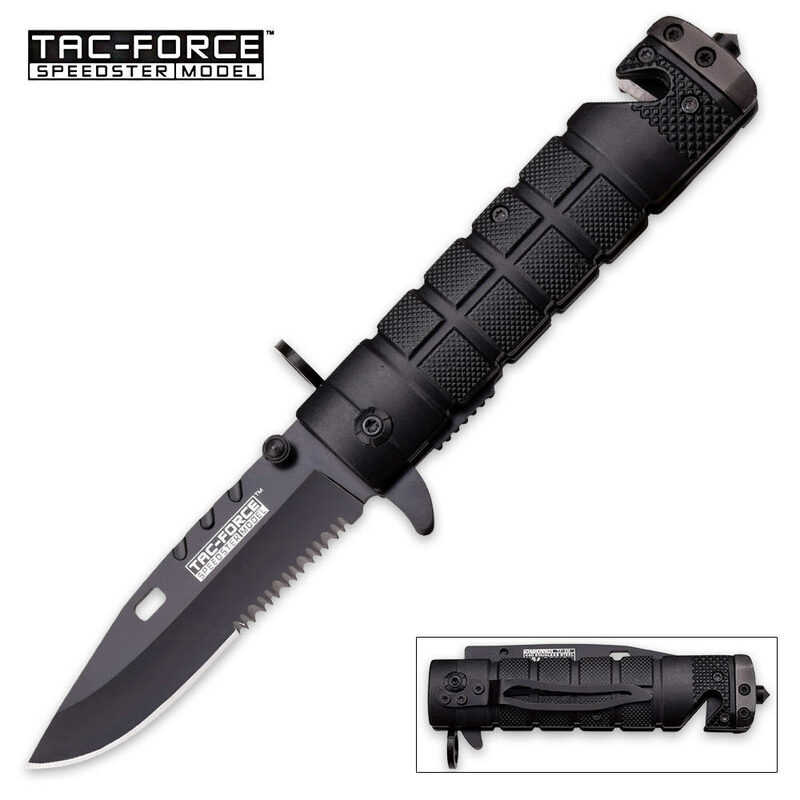 Its sharp, its quick, the belt clip makes for awesomely quick access. the window breaker is very useful and in great working condition. The belt cutter is sharp but located in a great location. This has to be easily the best and cheapest knife ive ever owned. The only reason this isnt a 5/5 is because the main screw holding the blade in place became loose. i tightened it up with a T8 screw driver piece i have in my computer tool set. after tightening it, it came out working just fine. Great knife and shipped crazy fast. As always knife came rediculously fast. Trueswords has fast shipping and all, but 2-3 days, thats awesome. I was very skeptical buying this and not having a review because you cannot see the hole for "bayonet" feature, but very happy to say is the hole is there making this knife awesome. Cant put it over anything, looks very proportionate, so maybe a toy or possibly small airsoft, but deff not a real rifle. Knife over all is very sturdy and much heavier than other knives ive bought from here, so thats a huge plus. overall great feel to it. Spring assist is smooth, does take some pressing to get it open, but prevents accidental opening. bayonet hole and wing to open blade is close together, but not a huge issue. Came sharp, very impressed with this buy, and at 8 bucks? are you kidding me? BUY BUY BUY!